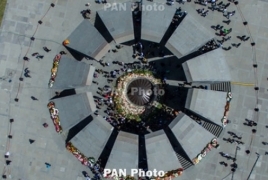 PanARMENIAN.Net - Fox News commentator Lisa Kennedy Montgomery (referred to mononymously as Kennedy) has urged U.S. President Donald Trump to recognize the Armenian Genocide. According to Kennedy, Turkey is not the Washington's strategic partner, but "a corrupt, murderous regime that should be kicked out of NATO for a host of human rights violations." "...While the president is hot under the collar, if he really wants to make his new party pal Kim Kardashian happy, he should officially and once and for all acknowledge the Armenian Genocide which was not an "issue" or a series of unfortunate events, but a cold-blooded slaughter of 1.5 million people whose memory will not be erased by any Napoleonic nincompoop," she said.